Our Logan Portable Infrared Quartz Heater is the perfect heating solution for living rooms, dining rooms, bedrooms, kitchen areas, basements, and craft rooms. Plug this electric heater into your wall outlet and immediately enjoy the warmth. Its heat exchanger combines with the humidity in the room to provide soft, moist, safe heat without reducing oxygen or humidity. The Cozy Foot Warmer Heated Floor Mat keeps feet warm and cushioned in chilly conditions using both radiant and direct heat. It can also be used as a thawing mat for winter boots and snow-covered shoes. Uses just 90 watts 5% of the energy of a traditional space heater. The DEWALT<sup></sup> industrial radiant propane heater, is construction-grade quality built for the Canadian winter. It contains a commercial-grade frame, collapsible handle and flat-free tires. Its typically used for workshops, barns, job sites, and home remodeling. CSA approved, and tested on the jobsite, its Guaranteed Tough. Dyna-Glo Delux multi-fuel forced air heaters provide immediate relief from cold weather working conditions. Ideal for residential, industrial and commercial applications, multi-fuel heaters require little to no assembly and are 98% fuel efficient. This multi-fuel forced air heaters operates on 1 K kerosene, # 1 diesel, and # 1 fuel oil. Heating coverage is up to 4,200 square feet. Self diagnostics, thermostat, LED readout and cord wrap features are included. 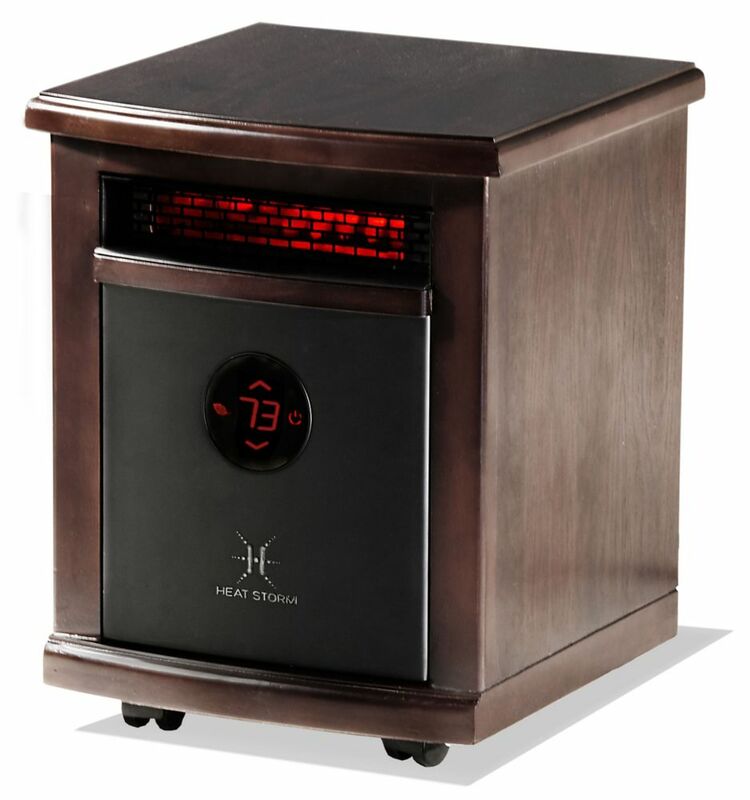 Logan Portable Infrared Quartz Heater Our Logan Portable Infrared Quartz Heater is the perfect heating solution for living rooms, dining rooms, bedrooms, kitchen areas, basements, and craft rooms. Plug this electric heater into your wall outlet and immediately enjoy the warmth. Its heat exchanger combines with the humidity in the room to provide soft, moist, safe heat without reducing oxygen or humidity. Logan Portable Infrared Quartz Heater is rated 4.0 out of 5 by 6. Rated 5 out of 5 by Alisa from works well right out of the box. in use for... works well right out of the box. in use for only a few weeks so it is we will see how long this one lasts . It is stylish and compact. It throws heat out close to the floor. Rated 4 out of 5 by Betty from Don't know yet if it will really do the job... Don't know yet if it will really do the job as it is not winter yet. That will be the real test.However, it does take the chill out of the air early mornings pretty well. Rated 4 out of 5 by Joe from Fan a little noisy. Heats good. Fan a little noisy. Heats good. Rated 2 out of 5 by Dude from Did not effectively heat even a small area. Had to return. Did not effectively heat even a small area. Had to return. Rated 5 out of 5 by Chuck from This heater warmed a large basement area in just a matter of minutes. I also like the "half-powe... This heater warmed a large basement area in just a matter of minutes. I also like the "half-power" option as it maintains the room temp and at the same time saves electricity. I would definitely suggest this unit. Rated 4 out of 5 by Ed from Bought it for our daughters house. She loves it. ... Bought it for our daughters house. She loves it. In order to heat the three rooms adequately, we suggest having a heater in each room. Yes, the units will heat up to the set temperature and then shut off. The heater itself is safe to pick and move. How many Watts does it use maximum?